A pair of young would-be lovers stumble across a the scene of a gruesome murder in the fictional village of Crobost set amid the very real landscape and society of the northern end of the Isle of Lewis. A police team is flown in from Inverness to investigate the murder and parallels quickly emerge with an earlier unsolved killing in Edinburgh. Detective Inspector Fin Macleod led the earlier investigation, and he is sent to Lewis to help with the hunt for the killer there. And, as it turns out, sent home. Fin was born and brought up in Crobost, gratefully leaving without a backward glance to go to university seventeen years earlier. And so we embark on two highly involving and very well told storylines which emerge in alternating chapters. On the one hand we are given an account of Fin's role in the investigation, carried out despite the opposition of the senior officer from Inverness and told in the third person. Were the two killings carried out by the same person: or is the second a macabre copycat based on press reports of the first? What link could there be between Crobost and Edinburgh? The story of the investigation is interwoven with first person accounts of episodes from Fin's childhood and youth, of love found and lost, and of tragedies endured. Through Fin's taking part during his last summer on the island we are also given a detailed and accurate insight into the centuries old tradition of the Guga hunt, where each year twelve men from the northern tip of Lewis spend two weeks on the remote rocky island of Sula Sgeir, translated by author Peter May into the nearby fictional island of An Sgeir, hunting 2000 young Gannets for their meat. As the book develops, the twin strands running through it begin to converge and overlap, and as it reaches its genuinely exciting and unexpected climax, the link between the two murders becomes all too clear. This is an outstanding and unusual piece of crime fiction told by someone with a deep understanding of the setting he has placed it in. 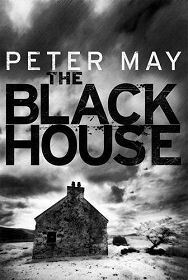 "The Blackhouse" will form the first part of Peter May's "Lewis Trilogy": its successor is the equally superb "The Lewis Man".